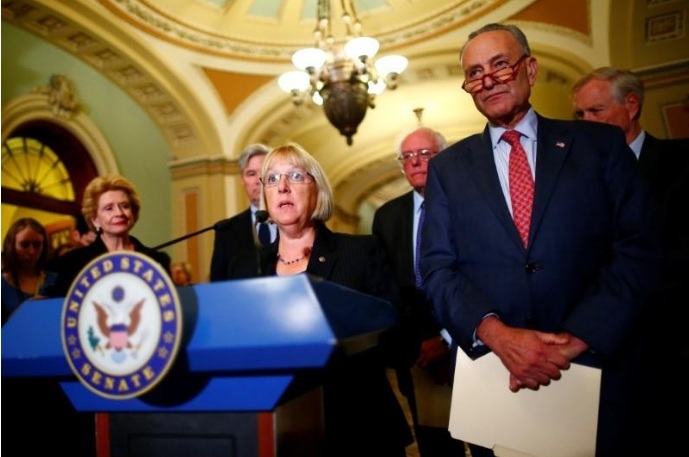 Senator Patty Murray (D-WA), flanked by Senate Minority Leader Chuck Schumer (D-NY), speaks to reporters on following a policy luncheon on Capitol Hill in Washington, U.S. October 17, 2017. WASHINGTON - Two U.S. senators on Tuesday reached a bipartisan agreement to shore up Obamacare for two years by reviving federal subsidies for health insurers that President Donald Trump planned to scrap, and the president indicated his support for the plan. The willingness of Sanders, a liberal champion, to offer his support of a deal with Republicans that could allow states to change some Obamacare requirements provided a boost to the Alexander-Murray effort. ”We are going to overturn what Trump is trying to do,” Sanders said. Two U.S. senators on Tuesday reached a bipartisan agreement to shore up Obamacare for two years by reviving federal subsidies for health insurers that President Donald Trump planned to scrap, and the president indicated his support for the plan.